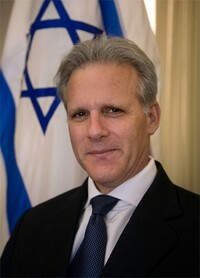 Apr 28, 2010 — Israel’s ambassador to the United States, Michael B. Oren, will deliver the keynote address at Yeshiva University’s (YU) 79th commencement ceremony at The Theater at Madison Square Garden in New York City on Wednesday, May 26 at 11 a.m. Senator Joseph I. Lieberman (ID-CT) who was awarded an honorary doctorate from the university in 1989, will deliver the opening invocation and Rabbi Haskel Lookstein, spiritual leader of Cong. Kehilath Jeshurun, a 2008 honorary doctorate recipient, will present the closing benediction. Please visit the YU commencement page for dates, locations, directions and information on ceremonies for all Yeshiva University schools and affiliates. Each year, YU confers honorary doctorates upon individuals who have exemplified true leadership and philanthropic values. This year, President Richard M. Joel will confer an Honorary Doctor of Humane Letters degree upon Ambassador Oren; Rabbi Moshe Gottesman, a respected Jewish educator will receive an Honorary Doctor of Divinity degree; Alfred Henry Moses, a philanthropist, communal leader and former US ambassador to Romania will receive an Honorary Doctor of Laws degree; and Zygmunt Wilf, who serves on YU’s Board of Trustees and the Albert Einstein College of Medicine Board of Overseers and is chairman of the Minnesota Vikings, will receive an Honorary Doctor of Humane Letters degree. Dr. Sylvia Wassertheil-Smoller, professor of social medicine at the Albert Einstein College of Medicine and a renowned researcher, will be awarded the Presidential Medallion in recognition of her groundbreaking work in cardiovascular disease. More than 2,000 graduate students in the fields of law, medicine, social work, education, Jewish studies, and psychology, as well as undergraduate students from Yeshiva College, Stern College for Women, and Sy Syms School of Business, will be awarded degrees. A graduate of Princeton and Columbia, Ambassador Oren was formerly the Lady Davis Fellow of Hebrew University, a Moshe Dayan Fellow at Tel-Aviv University and the Distinguished Fellow at the Shalem Center in Jerusalem. He has been a visiting professor at Harvard, Yale and Georgetown. Ambassador Oren has written extensively for The Wall Street Journal, The New York Times and The New Republic, where he was a contributing editor. His two most recent books, Six Days of War: June 1967 and the Making of the Modern Middle East and Power, Faith, and Fantasy: America in the Middle East, 1776 to the Present were both New York Times bestsellers. Raised in New Jersey, where he was an activist in Zionist youth movements and a gold medal-winning athlete in the Maccabia Games, Ambassador Oren moved to Israel in the 1970s. He served as an officer in the Israel Defense Forces, in the paratroopers in the first Lebanon War, a liaison with the U.S. Sixth Fleet during the Gulf War and an IDF spokesman during the second Lebanon War and the Gaza operation in January 2009. Ambassador Oren acted as an Israeli Emissary to Jewish refuseniks in the Soviet Union, as an advisor to Israel’s delegation to the United Nations and as the government’s director of Inter-Religious Affairs. He has testified before Congress and briefed the White House on Middle Eastern affairs and has served as Israel’s ambassador since May, 2009. With a passion and commitment to transmit Torah values and educate future generations of Jewish children, Rabbi Moshe Gottesman has been a dedicated Jewish educator for 55 years. He served as dean of the Hebrew Academy of Nassau County (HANC) for 16 years with the philosophy that every child deserves a good education. He is the founder of the Gottesman Learning Center for special needs children and a co-founder of CAHAL (Communities Acting to Heighten Awareness and Learning), a consortium of schools in Nassau County providing classes for developmentally challenged youth. Ambassador Alfred H. Moses has had a distinguished career in public service spanning more than three decades. An attorney, he served as Special Advisor and Special Counsel to President Carter and in 1994 President Clinton appointed him Ambassador to Romania where he served for three years. In the 1970s, he represented the organized Jewish community in Romania in negotiations with the Ceausescu regime to facilitate the emigration of Romanian Jews to Israel. He has lectured extensively on European and Middle East issues with articles appearing in prestigious publications such as The New York Times, The Washington Post and The Jerusalem Post. Ambassador Moses was elected four times as national president of The American Jewish Committee – the longest serving president in more than three decades. Zygmunt “Zygi” Wilf is a dedicated philanthropist, attorney, owner of the Minnesota Vikings and a real estate magnate. He serves on the YU Board of Trustees as well as the Albert Einstein College of Medicine Board of Overseers. A trustee of several family foundations, Mr. Wilf’s philanthropy includes supporting major Jewish educational, religious and healthcare concerns. He serves as a board member of the American Society for Yad Vashem, the Rabbinical College of America and as an advisory board member of the New York Law School, Center for Real Estate Studies. Dr. Sylvia Wassertheil-Smoller is a professor in the Department of Epidemiology & Population Health and head of the Division of Epidemiology at YU’s Albert Einstein College of Medicine. She has been an investigator in groundbreaking clinical trials in hypertension and in cardiovascular disease. Dr. Smoller was the Principal Investigator in the Women’s Health Initiative, a multi-center study including over 160,000 women. She escaped the Holocaust with her parents through the efforts of Japanese Consul Chiune Sugihara and published a novel about World War II entitled, “Rachel and Aleks” based on her family’s history.